In 1976, on my 25th birthday, I had the great good fortune to meet Mme. Margaret Chaloff, one of the most influential teachers of my life. It was a fateful kind of meeting, she even said so almost immediately, and it became instantly clear that i was there for a reason. I have written an account of the meeting elsewhere, but my birthday gift that day was the beginning of a remarkable process of rebuilding my piano technique and my relationship with music and life itself. 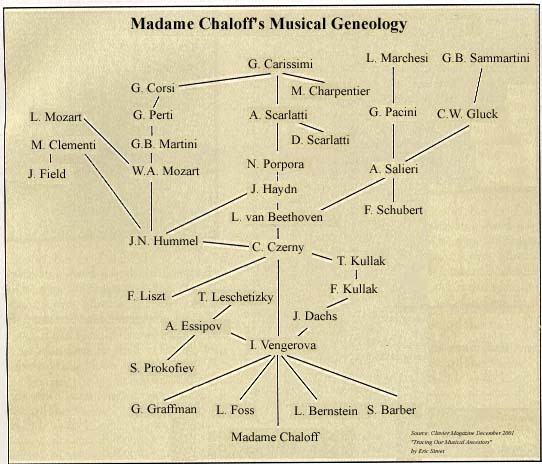 Mme Chaloff was the holder of a lineage of sorts, in more ways than one. But the lineage she held in music was quite profound. It was a family tree that included some of the all time greats of Russian and European music, and then in later years those in the Americas as well, from Mozart to Bernstein. Originally it came from Russia, I believe. And she had already passed the lineage on to an impressive list of pianists in the jazz field before i met her. So, needless to say, I was very excited to delve into this “upgrade”, so to speak, of my musical life. But what i soon found out, as my studies with her began, was that it was to be a kind of spiritual initiation too, which, when combined with the music practice, presented itself to me as a kind of life-practice, a spiritual journey that included music but also went way beyond it, and brought back an incredible depth perception into the equation of life and music. What i noticed immediately was a kind of presence in her studio. She lived in a small apartment in Boston on Commonwealth Avenue. It was neatly crammed full of music, books, recordings, pictures, and much more. And in the middle was the old Steinway grand, with the keyboard a few keys shorter than the customary 88. But there was a kind of vibrancy in the apartment, that came from her presence, which was quite refined by the time i came into her life. She would look up at me straight in the face, with her piercing blue eyes, and a mischievous grin, and bring me directly into the present, and the presence. She would always ask me how i was doing, and when i began to tell her, she invariably would stop me, and go over to the keyboard and play my note, the one we had ascertained in the first lesson was the frequency of my speaking voice. Until i could talk to her from there, which was down in my belly, she didn’t even want to hear what i had to say. Then, when i would sit down to play she would do a similar thing with my arms. If my arms were not weightless, and in “suspended animation”, then she didn’t want to hear what i had to play. I had some classical pieces i was working on, but we rarely got past the first note. If that note didn’t sing, then she didn’t want to hear any more. She would stop me, and then we would go back to working on playing one note. The note, or tone, as i’d prefer to call it, had to have certain qualities. It had to be “singing”, and so, your voice had to be involved. And now as i can see, much later, it is really the throat chakra, which is the center of manifestation in the body, that gets involved when the vocal element of the technique is included. Also the tones need to rise, and can even be sent to others long distance for healing. One of the exercises she gave me to practice was the entire process of playing one tone, from the conception to manifestation, listening to it all the way until it completely disappeared. This exercise would usually take the first hour of my practice period, five times with each finger of each hand. After going through that, then to play a chord and to listen to the harmonic interactions happening between tones would get truly psychedelic. It helped me to see that there’s a whole other level of listening, or hearing, when the mind is dissolved. In silence, the hearing opens into the depth perception of infinite space. The technique itself is really a full body-mind yoga, which is the full potential of the process of playing music. This is not something Mme Chaloff ever said, however. This is what i have realized about it, when combined with some kind of practice of presence or meditation. On one level it is a very simple practice, but the ramifications and subtleties of it reveal themselves the more you work with it. It includes physical hand exercises which synchronize the breath with the fingers, as well as with the creative centers in the brain. It includes two basic ways of striking a tone on the piano, one for melodic playing, and one more for chords and accents, but there is an infinite spectrum of combinations of these two basic key strikes. Which brings me to the point that, in certain ways this technique, which i am calling “Chi Touch”, is like a martial art, and a Chi-Kung kind of practice. The hand exercises, when practiced correctly over time, energize the hands very powerfully with Chi. And they are practiced with the belly, or hara involved. So the connection between the hara and the fingertips becomes involuntary, that is it happens automatically, without having to put attention there. And I am noticing that playing in this way activates the acupuncture meridians that end in each finger, which can make playing piano actually healing on another level. We all know music is good for you, but this is an obvious example of one of the many ways it works. In Spanish, the word “tocar” is used to mean “play” as in playing music. But tocar means to touch. So how you touch your instrument is of ‘key’ importance. get it? 🙂 And one of the most important factors in developing your own sound on an instrument is that of your “touch”. Also, the strike itself, of the tone, is a bit like a punch in a martial art, (but it’s like a one-finger mini-punch) or perhaps a bit like a sneeze. Each note is a moment where you disappear. You are relaxed before the note begins. You are gone when it happens, and then you are relaxed again after it has been struck. Only creative energy exists there. It transforms music into a blissful process. However, the hardest part for me to get, in the lessons with Mme Chaloff, was the simplest part. The arms have to be weightless. Muscles in the arms are really not to be used. The Chi is what will be playing the music, not the muscles. And that chi is directed by the breath. Please bear in mind, she never used the word “Chi”. But after playing this way for years, and also studying Chi Kung for years as well, it is my experience that this is exactly what is happening. The chi is playing, not the muscles. There is no “doer”. But every time i would start playing, she would lovingly slap my arms and make fun of how they were like a pump handle, heavy, and still “doing”. And then she’d pace around the room looking very stern and tell me she had no idea what she was going to do with me. But the loving connection remained, so i always got inspired to go deeper. I wanted to “crack the code”, so to speak. We worked a lot on the arms, connecting them with the breathing, in a way that made them like a feather, ready to go wherever with the slightest breeze. This makes you available for the in-spiration, which comes with the inbreath. The breath actually fills the arms and makes them weightless. When this technique begins to work for you, it is exhilarating, really. That’s all i can say. Suddenly, you are soaring, weightless, expressing effortlessly through the entire body-mind, with your voice, through your instrument, your divine soul as pure melody. What could be better than that? But always with grounded precision, connected in with the belly in a way that keeps it real, and not just floating off in the clouds, in some kind of new-agey way. I took the whole process as if i were working on a Zen koan. The weightless arms, and playing without using the arm muscles was hard to conceive of. Mme Chaloff told me to watch birds, so i did. The technique allows you to be a bird as you play, to fly. But each week i would come back, and no, i was still trying too hard. Part of the process was to bring the attention to the midbrain, to fall back from the frontal lobe obsession that can happen while playing. This brings out an involuntary quality into the process, which gives the creativity a kind of power and depth that is not possible when you are entranced in the duality fixation of the right and left hemispheres. They are doing their thing, for sure, but if you have done your practicing, then “you” are not needed in those details. You are simply present as the primal impulse, and the “playing” happens on its own. After about 7 months or so of going weekly to Boston, i came to the lesson one day, and as i was warming up on the piano, Mme C. was in her little kitchen. After a bit she came in and said, yes, now you are getting it. This gave my heart such joy, because i felt that i had received this really beautiful gift through her. But yes, somehow the knack of it had clicked for me, almost like riding a bicycle. Some people get it faster than others. It’s really the knack of being present, is all. But the way the technique helps you to connect your presence with the instrument is nothing short of profound. It requires that you really be present in your body. And that your total energy is involved in the musical process. So after that, I really had only a few more lessons. And one day Mme Chaloff said to me, “well, I guess you won’t be needing me any more”… and then within a week or two she passed away. The whole process blew me away, really. It felt like i had been handed something to benefit my life, as if in a relay race. A kind of torch was passed to me, and just in time, too. Combined with aspects of many other journeys i have taken since, in music and spirituality, I am interested in offering this approach to music to any who sincerely has an interest to learn it. Although the technique itself was developed for the piano, it is adaptable to any instrument really, but especially helpful on instruments that do not use the breath already for tone creation, such as horns. But it is also an example of a way to allow your creative process to be your spiritual practice. That is what i am calling Source Creativity. If you are interested in exploring this further, please contact me. I am exploring ways to share it that involve the internet too. However, there is an “in person” component to the technique transmission itself, that is important. Some can get it very quickly. A single consultation can give some people enough to work on for the rest of their life. But problems can arise when you practice mistakes, or wrong orientations. That is where the qualified teacher can make all the difference. One little pointer can save you years of misdirected work. 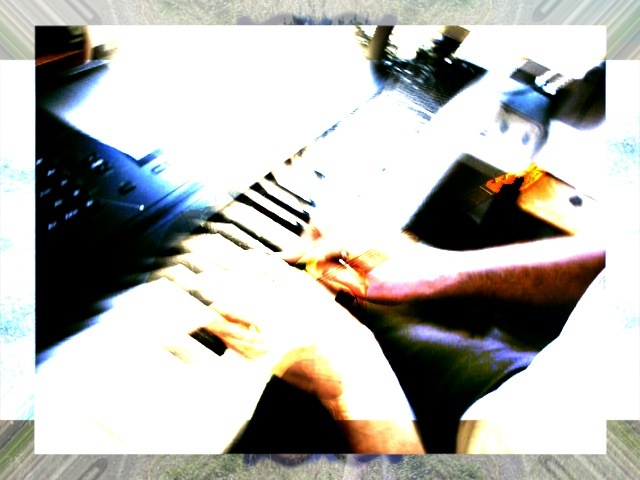 Chi Touch is a part of a larger offering of music practice, which is part of the Source Creativity Teaching. Our goal is to find new ways to learn and experience creativity and its connection to spiritual practice. In the Indian music tradition, that process still exists with the master student relationships, but somehow the tradition got lost in the West, where everything became more academically based. Even jazz, which started out as an oral tradition, has now been absorbed into the academic system. And somehow the radically free nature of jazz is being eroded in the process. So we are looking for fresh approaches to music, deeply honoring ancient traditions, but also looking forward toward a fresh horizon, where music can come truly alive in a new way. Music is a vast sacred language, capable of expressing everything, from the lowest to the highest. Let’s not forget that we ourselves are really the instrument, and our instrument is just an extension of that. The Chi Touch approach is an integral way to practice that totality, and to connect body/mind and instrument as one.